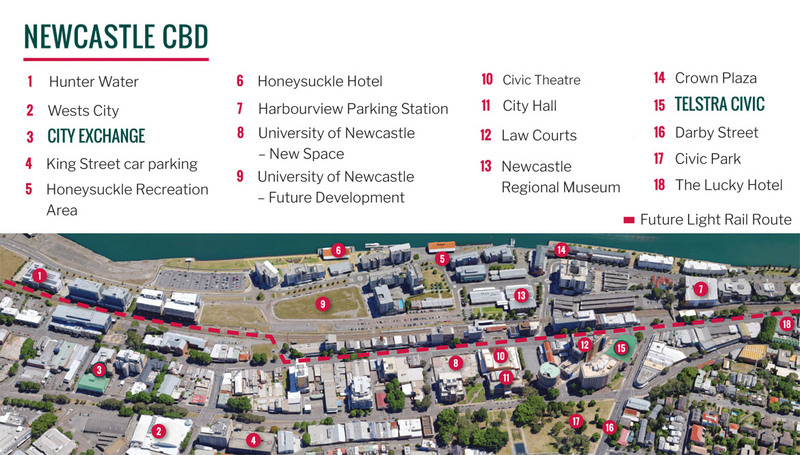 Situated in a high profile location the City Exchange enjoys frontages to the CBD’s two main thoroughfares, Hunter Street and King Street and combines two buildings with a mixture of secure on-grade and basement parking. The City Exchange is set to undergo an external refurbishment in 2018. Once complete the façade will feature a three dimensional boat and wake, designed by international award-winning architect THERE Architects. This will be complemented by additional external public art as well as foyer and courtyard upgrades. A Development Application for 25 apartments was lodged in early 2018 to be constructed atop the office complex. The apartments have been designed by award-winning Newcastle Architects CKDS. With the growth, additional parking needs are being met by way of car parking stackers. The property is part of the ‘City Exchange’ complex that won the Urban Taskforce Australia ‘Development Excellence Award for Adaptive Re-use 2011’.